Billy Corgan makes his advertising debut in this bizarre, low-budget and cobranded ad for Resistance Pro Wrestling and Chicago furniture retailer Walter E. Smithe. 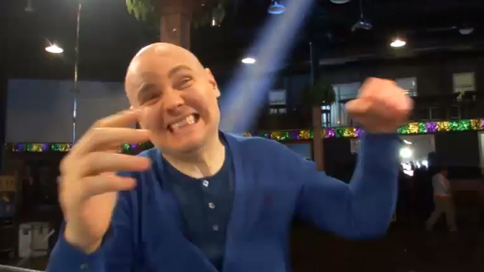 By way of explanation, the Smashing Pumpkins frontman has been a wrestling fan for years, and opened Resistance Pro as his own wrestling promotion firm in 2011. As if the connection between Smashing Pumpkins and smashing skulls wasn’t confusing enough, this ad also isn’t altogether clear what's being sold. It’s technically an ad for the Chicago furniture shop, which is known for its zany local commercials, but Corgan’s wrestling site gets prominent billing, too. The Chicago Tribune reports that Walter E. Smithe donated $50,000 to animal-rescue group PAWS Chicago as compensation for Corgan’s appearance. The Smithe brothers, who appear in the ad as Corgan’s musical chairs competitors, say they hope the spot will help them launch a new furniture line aimed at 24- to 40-year-olds. Via Rolling Stone.